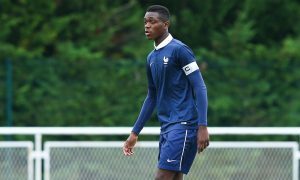 One of France’s greatest young talents, Dan-Axel Zagadou, is reportedly torn on whether to join Manchester City or stay at his current club, Paris Saint-Germain. Zagadou, a 17-year-old defender, was recently invited to take a look around the City Football Academy and is said to have been shown around the complex by Pep Guardiola himself. PSG have lost a number of high-profile talents in recent years such as Kingsley Coman and Moussa Dembele, and the French media believe that Zagadou may follow suit. France Football imply that Zagadou was unimpressed by PSG’s offers of a first professional contract, swinging the pendulum in City’s favour. Zagadou was first linked to the Blues over a month ago by ESPN, who claimed that City had beaten Barcelona, Manchester United and Juventus to his signing. Not many can claim to have seen all that much of Zagadou on the pitch, but when Pep Guardiola is personally giving a player a tour of his club, you can infer that they might be something special.